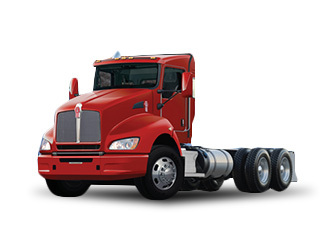 When “medium duty” just doesn’t seem heavy duty enough for the job you have in mind, turn to a Kenworth T440 or T470. Serious workhorse solutions for more demanding regional haul, pickup and delivery, municipal and vocational applications, these vehicles far outpace other trucks in this category. Each is available in a straight truck or tractor in GVW ratings from 33,000 lbs to 68,000 lbs. The T440 features modern aerodynamic styling, excellent visibility and maneuverability, superior ergonomics, and a fuel efficient powertrain – all, in a robust chassis design meant to deliver a lot more value over the long haul. Get all the details about this truck, from the design specs, versatility, ergonomics, reliability, options and heavy duty support.